Has your garage been taken over by junk? Maybe not trash but items that we store thinking we may need to use them someday such as empty boxes, outdated electronics, sports gear, etc. Once you’ve made some room in your garage it’s not necessary to fill back up every nook and cranny with more stuff but there are some essential tools that every garage workshop should have which will prepare you to tackle any project that comes your way. The number one reason for having a clean workspace is safety. Getting things off the floor will prevent you from tripping and also make it easier for you to see items when they are hanging on the wall or organized neatly. By clearing off your work table you have the most room to operate and won’t misplace nuts and bolts under paper or trash. It also gives you piece of mind to start a project with a clean slate instead of having to clear out old and unfinished work before starting new. A primary investment of any garage workshop are the tools. You need to protect this investment with a high quality tool chest that is nicely organized and if needed lockable. Look for smooth rolling ball-bearing draws and if buying used beware of rust and dirt that could corrode your tools. We recommend installing drawer mats to keep your tools from sliding around as well give them a softer cushion to sit in. We’re extremely happy with this unit we won at the Craftsman Blogger Summit Build-Off event. We love the stainless steel look and the variety of drawer sizes is able to accommodate all types of tools and gadgets. Instead of schlepping extensions cords across your garage floor, setup a workshop with enough power outlets to charge your batteries as well as power your corded tools. Also consider outlets needed for lighting, heaters, AC units and radios or televisions. You simply can never have too many outlets and it’s much safer to have too many than not enough. Be aware of the load your workshop is drawing and bring in an electrician to help plan and install these outlets. Your garage is probably very dark. You may have a couple of overhead lights from the garage door opener and a few recessed ceiling lights but they are simply there to make sure you don’t trip in the dark. When most homes are built, the garage lighting is never a consideration, but when you are planning to use your garage as a workshop you need to make sure you upgrade your lighting. Track lighting is an easy option to install and gives some directional overhead lighting but it missed out in overall room illumination and if you are leaning over a project such as soldering you might get shadows so make sure you also have a work table lamp. We’ve had success installing a motion detection on/off switch so if our hands are full we don’t have to worry about turning on a light and we also don’t worry about leaving a light on and wasting energy. Many garage spaces aren’t insulated so you take the extra step to insulate your garage to stay warm and cool or setup some space heaters or floor AC units. Having to wear a heavy coat will impeded your DIY efforts and nobody likes working in a sauna. You need to make sure you have enough outlets to power these units and choose them carefully. A lot of people also have success with propane heaters but be careful when using in semi-enclosed spaces. Garage floors aren’t the best work shop floor surfaces. They stain and become slippery with any type of liquid. They are also tough on your body after years of working over. 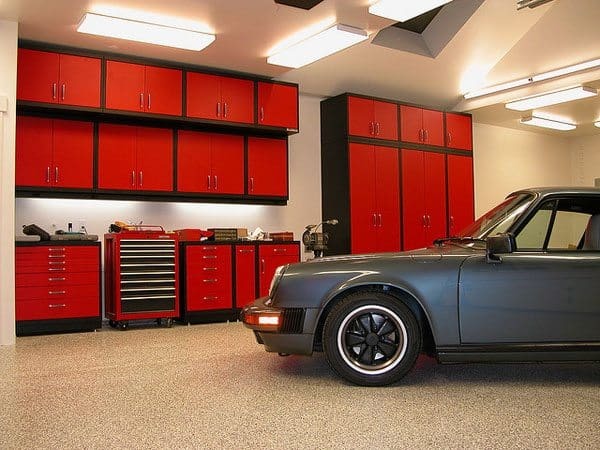 Consider giving your garage floor an epoxy finish which is easier to clean and can also provide extra grip. If you are seeking a softer surface then check out those restaurant grade rubber floor mats or some of the more durable options from FLOR. From the weekend DIY warrior to the skilled craftsman, their set of tools is a very personal choice. Some people will only buy DeWALT, others Milwaukee. Snap-On or Craftsman. The brand loyalty goes on and on. Beyond your standard set of hand tools and power tools, there are some stand alone tools that could come in handy in many workshops. Drill press for making precision cut holes and bore depths that are equally spaced. Table saws for cutting larger pieces of lumber quickly and accurately. Belt sander for quickly smoothing and shaping wood. Abrasive blasters are great for removing paint, varnish and rust so surfaces refinished. You’ll also need a blast booth. Welders are indispensable if you are into metal fabrication. Throw in a bender and shear and no one can stop you. Most of us enjoy listening to music while working on projects and if you want to forego a full-on audio system and their fragile components, consider these new rugged portable listening stations from DeWALT. You can run your mp3 player or smartphone music through them and they create remarkably incredible sound. The major bonus is that they are powered by DeWALT’s 20V MAX cordless battery system. They can also be plugged in and will charge a battery as well as provide extra outlets. If you need visuals then you can mount a flat panel TV to any wall and stream movies and music through a digital device such as Apple TV or Roku. By going with a TV you are bordering on man cave territory which is absolutely ok. It’s your workshop and whatever you need to make your work environment work for you the better. If you are serious about keeping things clean then your ultimate workshop should also include a dust collection system, central vacuum and air ventilation system. All three of these systems will keep the dust, dirt, pollen and other air and heavy particles off your clothes and out of your lungs which makes for a safer work environment. Did we leave out any must-haves for your ultimate home workshop?